With a thirst for his native Brazilian rhythms, guitarist Renato Candro first learned to play the guitar at only seven years of age, under the tutelage of both his father and his grandfather. From there, his passion took him to great heights as a performer and a teacher. Influenced most by the great Baden Powell, a pioneer who singlehandedly introduced the rest of the world to Brazilian guitar music, Renato Candro passes on the gift to his students. Renato’s influences also include Tom Jobim, Caetano Veloso, Gilberto Gil, Milton Nascimento. In 1986, Renato launched his professional career as a member of a traditional Latin-American band. While playing with his group, he played festivals, theaters, outdoor shows, and other venues all over Brazil. His career has spiraled upward ever since. While playing at huge events such as the Festival Internacional de Violão promoted by SESC (1997, Brazil), he shared the stage with some of the world’s finest guitarists, including Scott Tennant, Ralph Towner, Egberto Gismonti, and the master of Brazilian guitar, Baden Powell. Not only is Renato a mesmerizing performer, but he also can teach. Renato has a gift for making the complicated rhythms and exacting technique of Brazilian guitar music seem easy. His students value not only his expertise on the guitar, but his ease of communication. Having learned to speak English at a high intermediate level, Renato developed his English vocabulary even more as a teacher in order to communicate with his students. He now specializes in teaching Brazilian guitar music to English-speaking students. As a university-trained composer and arranger, Renato can unpack the often-confusing world of music theory. With that knowledge, his students can learn to write their own Brazilian-themed music with confidence. 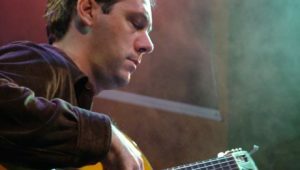 Renato is equally at home in the world of classical guitar, having studied the discipline under the watchful eye of noted classical guitarist Ana Maria Bedaque at the Universidade Livre de Música. He returned to the university to teach Brazilian guitar for two years, followed by a long stint at the Conservatório Musical Souza Lima, one of Brazil’s top music schools. Students appreciate Renato’s passion to teach traditional Brazilian guitar styles such as Bossa Nova, Samba, Choro, MPB (Música Popular Brasileira). To sign up for a 15-minute introductory Skype lesson with Renato, fill out our pre-registration form today.